As the month of April wraps up so does the current systemwide Hilton Honors bonus of 2,000 bonus points per night. Good news is there is no gap between that offer and the start of Hilton’s summer bonus. 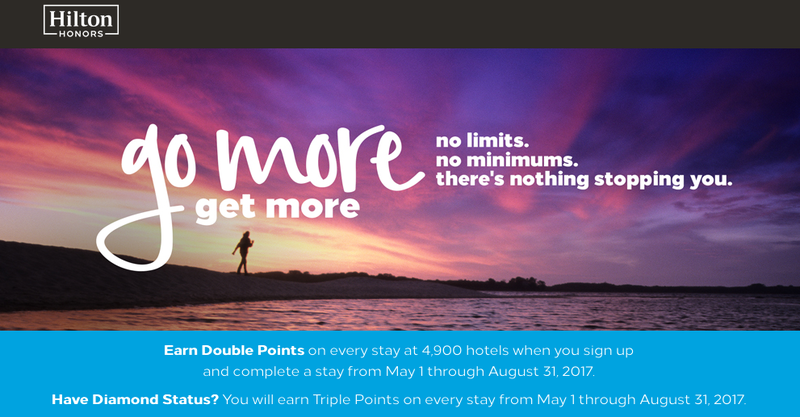 The summer bonus is double points on all stays Worldwide with all hotels participating. The bonus gets even better if you are a Diamond Elite member as you’ll get Triple Points. This bonus is good for those more expensive stays compared to the flat 2,000 bonus points we over Spring but for those stays that don’t cost much you’ll earn less with the double points offer. Remember as well if you book via a mobile you can earn 500 more points.